1 Preheat the oven to 170°C, gas mark 3. Place the coconut oil and maple syrup in a small saucepan and warm over a medium heat until melted. 2 Place the spices, oats, seeds and nuts into a large mixing bowl and pour over the maple mixture. Mix well to coat. 3 Pour onto a large baking tray and cook for 40 minutes, stirring occasionally, until golden and toasted. Remove from the oven and leave to cool completely. 4 Meanwhile, cut the rhubarb into 3cm pieces and place in 1–2 large roasting tins so that they sit in a single layer. Finely grate over the zest from the oranges, then squeeze over their juice and sprinkle with the sugar. Halve the vanilla pod lengthways and scrape out the seeds, then stir them and the pod into the rhubarb. Cover with foil and roast in the oven with the granola for 35 minutes, until tender. Remove from the oven, spoon into a bowl and leave to cool. 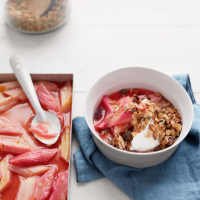 Serve the rhubarb scattered with the granola. Great with coconut yogurt. This recipe was first published in Tue Dec 23 11:47:00 GMT 2014.